Tagliolini, pronounced with a silent g, is a traditional cut of pasta from Emilia-Romagna region on Italy. Tagliolini, a type of tagliatelle, are long cylindrical ribbons of pasta and can be used in a variety of sauces. It is typically used interchangeably with fettuccine in pasta Bolognese, a slow cooked meat sauce. 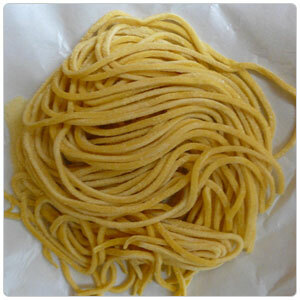 Tagliatelle and tagliolini are very similar and while tagliatelle is long and flat, tagliolini is long and cylindrical. Drop pasta in a pot of rapidly-boiling salted water until just cooked. Strain pasta and add to sauce, ragu or sugo. Finish cooking the pasta and sauce/ragu together until done. Since tagliolini are generally made as fresh pasta, the texture is porous and rough, making it ideal for thick sauces, generally made with beef, veal, or pork, and occasionally with rabbit, as well as several other less rich (and more vegetarian) options; such as briciole e noci (with breadcrumbs and nuts), uovo e formaggio (with eggs and cheese - a less rich carbonara), or simply pomodoro e basilico (with tomatoes and basil).